It may be April 1st, but the forecast is no joke with snow and bitter cold on the way for the Finger Lakes. 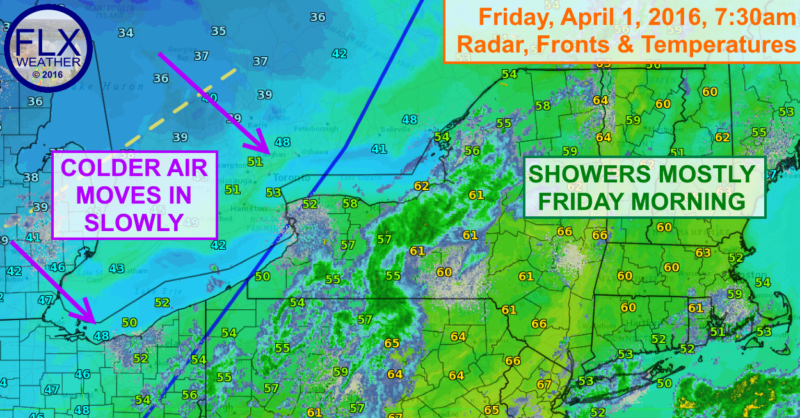 The first in a series of shots of cold air will slowly move east into the Finger Lakes today. Numerous rain showers out ahead of this cold front will continue through the morning hours before tapering off this afternoon. Precipitation should come to an end tonight. Temperatures are quite mild across the area out ahead of the front, with upper 50s and low 60s commonplace. The temperature will not rise much as the colder air seeps in from the west. Temperatures should start to noticeably fall later this afternoon from west to east. Hot on the heels of this system is another that will move through during the day on Saturday. More widespread showers and gusty winds will be likely, with temperatures peaking in the mid and upper 40s during the middle of the day. Temperatures will again fall later in the afternoon, with many places dropping into the 30s by sunset. The backward transition from spring to winter will become official Saturday night as a third system moves through. With temperatures continue to drop through the 30s and into the 20s, the precipitation from this system will be snow. The higher elevations of the southern Finger Lakes and the Southern Tier will see the most snow, where 2-4 inches will fall. Most of the rest of the Finger Lakes will see an inch or two, with just a coating to an inch along and north of I-90. Sunday will be a cold, windy day with occasional lake effect snow showers. Highs will struggle into the low 30s, but the wind will make it feel closer to 20 degrees. Yet another storm system is expected for Monday. Again, temperatures will struggle to reach the low 30s, so more snow is possible. Several more inches will fall, this time during the daytime hours, which could make for some difficult travel. The snow threat will end later Monday as high pressure builds in. However, with clearing skies and fresh snow cover, some extreme cold will become possible Tuesday and Wednesday mornings. Wednesday morning in particular looks frigid, with lows currently expected in the single digits across the Finger Lakes. This could be devastating to the local agriculture after the very warm March we had. Temperatures will moderate towards the end of the week, but should remain below normal through next weekend. So… does this mean I should not set out my onions on Saturday? I’m no expert on onions, but if they don’t like snow, I wouldnt!